Prior to the invention of wire fencing, farmers had to contain their livestock. They used what they had on hand and what was easy to obtain locally. For many of us this is a viable alternative especially when materials might be abundant but money for store-bought fencing materials is not. Many homesteads have woodlots that need to be thinned, wooded areas that need to be cleared for buildings, or just brush that accumulates from wind damage and old trees. Other places have an abundance of field stone. These things are a wealth of resources for building fences and that is exactly the way that our ancestors viewed them. When we moved to our little farm, the fences were in terrible shape. We knew that we would have to re-fence the entire property, but certainly didn’t have the money to do it all at once. We patched what we could and looked to the past for options in other areas that we couldn’t afford to replace or patch. What we found was a wealth of building and fencing material that was being wasted and underutilized. 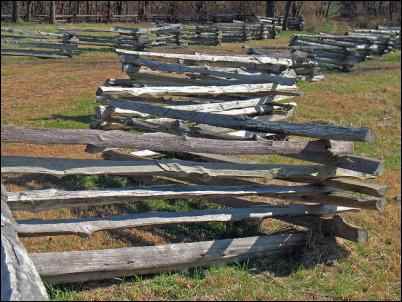 Two types of fence that dotted the colonial American countryside were split-rail fences and jackleg fences. Both fences are basically made out of logs from trees that were cleared to make room for the homestead’s various buildings. To colonial America, these trees were a wealth of raw material to be used. 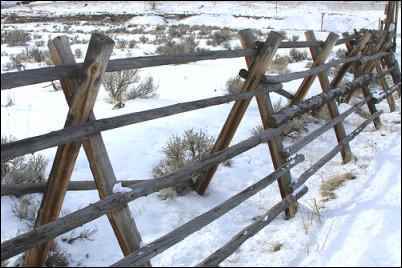 The split-rail fence was made by splitting logs usually into quarters or eighths, depending on the diameter of the log. This fence could either simply be stacked in a zigzag pattern or the ends of the rails could be tapered to fit into drilled holes in a post. Typically, there were three rails, but there could be four. If the rails were simply set on each other then there were more rails for added height. If the fence was to stand upright, the posts were set into the ground and the fence so that the fence ran in a straight line rather than zigzag across the landscape. Jackleg fences on the other hand have post sets fashioned in an X pattern that sit on top of the ground. These fences could be fashioned in sections and moved if needed, although that was a difficult task. The rails of the jackleg fence then proceeded down one side of the X forming the body of the fence. The top rail sat in between the joint in the X and stabilized the fence. Both of these fences were time consuming to build, however the raw material were readily available. The split-rail and post fence used less material for the same amount of fence length as the jackleg fence. The split-rail fence was a more permanent structure if it had posts that were anchored in the ground. A jackleg fence could be built in sections that could be moved by a few strong men to change the shape and size of fields. However, the drawback to this was that the jackleg fence could be tipped over in a good wind storm. The key was to make the bottom rail quite heavy to give it more stability. A jackleg fence tended to be built with whole logs so there was much less preparation prior to building the fence. A split-rail fence built in a zigzag pattern was not only sturdy, but aesthetically nice to look at and easily repaired if needed. We used a version of the split rail fence by building a log fence. We set posts in such a way that they would create a frame to hold logs. These logs were the trunks of “trash” trees that had overgrown our property and needed to be removed. The trees weren’t good for firewood or much else and we wanted to utilize them in whatever way we could. We have several posts set on the outside and then several more offset to the inside. In this manner, the logs could be set inside the post frame and became quite a sturdy fence that holds our small breed of heritage pigs. Working with logs in this manner can be sort of like solving a jigsaw puzzle if the trunks aren’t straight. However, that is a challenge that can easily be overcome especially when cost is a concern. Going back even further in time, many English farmers used hedgerows to fence small livestock such as sheep. Cattle could even be contained within hedgerows. Hedgerows were made by cutting saplings halfway through the trunk and then bending them over and anchoring them to the ground. This way the branches tended to grow upright. This formed the base of the hedgerow. Periodically, the farmer would cut the branches to encourage them to branch out and intertwine. This eventually formed the hedgerows that we often still see dotting the English countryside. However, the drawback was that this took time for the hedge to grow. While waiting for this growth many farmers would fill in the sparse hedgerow with brush that would provide a barrier while the hedgerow was growing a more permanent fence. By the time the hedgerow was fully filled in, the brush that had been used was mostly rotted away. Once the hedgerow was fully filled in, it provided a formidable barrier for small stock and would turn most large stock to keep them contained. A brush fence is just that, a barrier made out of brush that would otherwise be piled up and burned. We have a large number of old trees and they are constantly dropping limbs and brush. This is a constant source of material for building, as well as maintaining, this type of fence. The fence is relatively easy to install as you simply pile and compact the brush until you get it to the desired height. We wanted our brush fence relatively tall—about four feet—so that it would turn the goats. This type of fence is not for livestock that is determined to push its way through the fence. A brush fence is a psychological barrier more than anything else. The animal sees the fence and either thinks it is too much trouble or a solid wall since they can’t see through it well. I know of several hunters that have used these on their properties to help direct deer to their green fields. We use a brush fence along the back property line to keep the goats from going to visit our neighbor’s woods and green fields. This fence has also turned the horses, but our horses have never showed any particular interest in testing a fence. The wider a brush fence is the more sturdy it will be. If it is built relatively thin then it will fall over even more as it settles. Posts can also be set to brace the fence. We happened to have a lot of trees along the property line along with several old posts that worked well as braces for the fence. 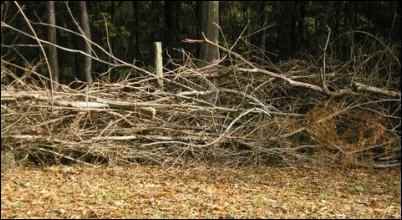 Since, we constantly have to clean up the dead limbs around the yard and farm it is easy to just stack them on a low spot of the brush fence. In this manner, it takes little effort to maintain the height of the fence. Wattle fences were another type of fence that was mainly found all over the English and European countryside in the 16th century. A wattle fence is simply posts hammered into the ground about 2 feet apart with small, thin, flexible green saplings intertwined through these posts. Surprisingly, because of the weaving method these fences were exceedingly strong and did well to hold larger livestock such as cattle and horses. There were actually people in England that made a living not only building this type of fence, but also growing the saplings needed to build them. The saplings for a fence were typically no more than two inches in diameter. 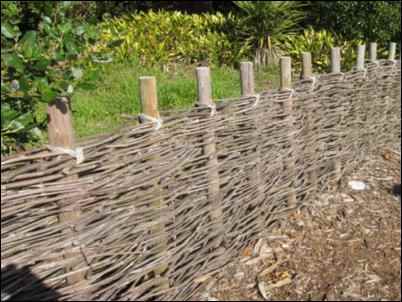 Wattle fences were typically used for small areas like the farmyard or garden area. We have used short wattle fences to keep the ducks away from our seedlings in the garden. We then used a taller and sturdier wattle fence around the old chicken coop which is now the winter pig yard. This wattle fence is sturdy enough to hold in the pigs and has been in place for three years now. The only maintenance that has had to be done to this fence is to hammer the posts into the ground a little farther each year as they begin to rot. This way they stay tight until we have to replace them altogether. They also built wattle hurdles which were probably the precursor to our modern day livestock panels. They could be used to contain small livestock in a small area, as gates into livestock housing, and also to move animals when the farmer wanted a barrier between himself and the animals. The hurdles were typically made with wisteria or willow branches which were extremely light, but flexible enough to be bent and twisted without breaking. To build a hurdle, they would use small saplings for upright supports for weaving. They would stabilize those by sticking them into holes drilled in a large log. Then, they would take the willow branches or wisteria vine and weave it in and out of the uprights twisting it around the last upright and continue back in the other direction. When they reached the end of the vine they would then start several uprights back from where they ended which would secure the first vine into place. Once all the weaving was finished the hurdle could then be removed as one piece from the log holding it. Wattle fences and hurdles were quite popular all across Europe and quite useful all around the homestead. Then there are stone walls, many of which are still standing, at least partially, today. Many areas of America, and Europe as well, had an abundance of stone which needed to be removed in order to plow and plant fields. Since there was such abundance, farmers naturally used this material to build fences and buildings. Most stone walls were dry stacked, meaning that there was no mortar used. The stones were fitted together tightly and in such a way that the friction imposed on each stone by its neighbor gave it strength without mortar. These stone walls were a much more permanent solution for fencing as they tended to last longer and needed less regular maintenance than any other type of fencing. They would also hold in most any livestock that the farmer wished to have so there were no worries about cattle or horses tearing it down. However, time did play a toll on these fences just like any other and they eventually did need repair as the stones would wear and loosen causing some sections of the wall to fall. Building these stone walls was also heavy work. Since our little farm is run on such a tight budget that often means we don’t have the money for new fencing. We have had to become quite creative and look to the past for our future. We have used wattle fencing, brush fencing, and have plans to build a jackleg fence in the near future. One thing that we love about all of these fencing alternatives is the beauty and the feel of stepping back in time. These fences blend into the landscape rather than standing out. The best part about them is the cost. They cost nothing more than time, gas for the chainsaw, and, in some cases, a few nails or screws. The worst part about them is the time they take time to build. Modern commercial fencing is much easier to put up and goes up quicker. The old methods of fencing seem to take forever while building, but for some areas of the farm are often more practical in terms of cost. These fences are not very hard to maintain but they do need more maintenance than some modern day fencing. However, I have some pastures that have electric fencing and I find that I am checking and maintaining the electric fence much more often than I am the brush fence that runs the back property line. Fencing can be a costly endeavor and many times stops the modern day homesteader from doing the things that they want to do. With these old world alternatives most homesteaders should at least be able to get started. I know it has allowed us to raise livestock while saving money for other projects or for better fencing. We have been able to do so much more with our little farm than we would have if we had to spend money on fencing. Looking to the past for solutions to problems isn’t so bad after all, even if it is more work.